Brookline Interactive Group (BIG) is hosting the first ever Public VR Lab Meetup event, and is thrilled to announce that FRONTLINE’s Virtual Reality team will be speaking at at this event. This event will take place on Thursday, August 4th, 2016 from 5:30-9:00 p.m. at BIG’s innovative community media space at 46 Tappan St in Brookline. At this event, the FRONTLINE team will speak about their VR production process and, for one night only at the event, share some of their immersive journalism projects. FRONTLINE Series coordinating producer Carla Borras and production assistant Kenzie Audette will talk about FRONTLINE’s foray into virtual reality, their virtual reality processes, and some of the lessons they have learned along the way. They will also share behind the scene stories from the filmmakers, some of the challenges FRONTLINE has faced pioneering high-end VR journalism, which include Night of the Storm, Return to Chernobyl, On the Brink of Famine, and Ebola Outbreak pieces, and tips for creating VR films. Brookline Interactive Group (BIG) is the organizer and co-sponsor of this event, along with Northampton Community Television, who are the founders of the Public VR Lab. The Lab is a collaborative effort to facilitate a public dialogue around new VR-related technologies, and support the community creation of 360, virtual and augmented content, access to tools and headsets, and socially-relevant and locally-focused VR experiences. BIG and NCTV have launched accessibility and literacy initiatives in VR at their community media centers in western Mass. See more about their accessibility and literacy initiative in VR at: http://publicvrlab.com/. In addition to FRONTLINE’s presentation, this event provides an exclusive opportunity for attendees to demo and experience FRONTLINE’s immersive journalism project on BIG and NCTV’s multiple HTC VIVE VR headsets and controllers. The event will also feature conversations about the future of the public Commons in VR, ample refreshments, and the opportunity to try other gaming and story-focused VR experiences. For questions about the August 4th Public VR Lab meetup event, please contact Kathy Bisbee, Executive Director of BIG, at kathy@brooklineinteractive.org. Brookline Interactive Group (BIG) is an integrated media and technology education center and a community media hub for Brookline, MA. BIG provides access to innovative media-making tools, facilitates diverse community dialogue, incubates hyperlocal storytelling, arts, media literacy and technology projects, and serves over 500 youth annually. BIG offers extensive multimedia training, collaboratively produces local content, and provides low-cost professional media services to non-profit organizations, education partners, businesses, and to local government. Northampton Community Television is a community media arts center whose mission is to serve as a model organization to enable expression of all kinds across mediums, providing resources and programming and educational opportunities to the community through all means technologically available. We are independent hyperlocal media. We are a physical public makerspace. We are a legal street art multimedia wall. We are a storytelling hub. We are an economic development organization. We provide opportunities for voices that do not have other opportunities. We provide free services to local nonprofit organizations and the community and tools for the professional multimedia community. First came radio, then television, then the internet. 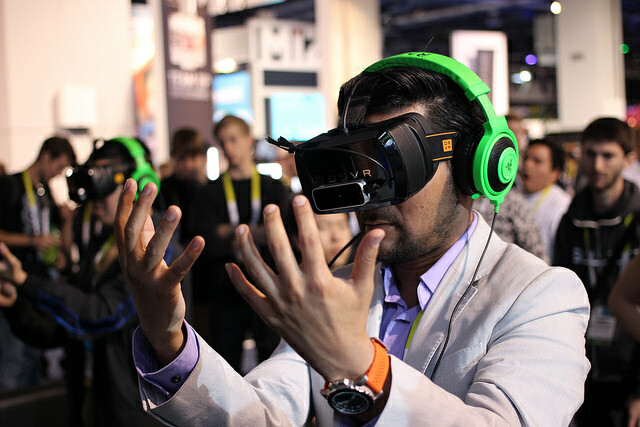 The next big thing to shake up the way people consume media may be virtual reality, according to a growing chorus of media experts. “I think VR is as big as the internet,” said Kathy Bisbee, Brookline Interactive Group’s executive director. 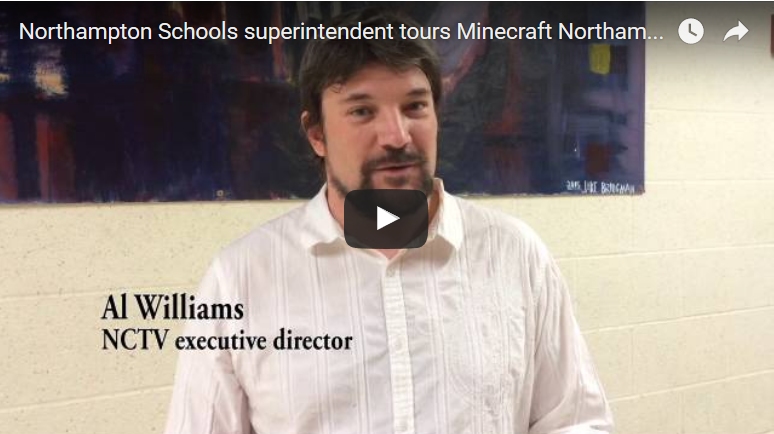 Northampton Schools Superintendent John Provost took a tour of his downtown office Tuesday. But this version of his office behind City Hall was built by a Northampton High School student. And the tour, well, wasn’t exactly rooted in reality.